Please note that this page contains a number of linked resources, and can be data-heavy. If it is taking too long to load, please try our low-bandwidth option here. Links are from a number of sources, and all data is their responsibility. 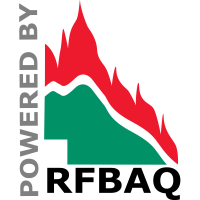 The RFBAQ cannot accept any responsibility for mistakes, omissions, or how you choose to utilise this data. Can also display clouds, rain, etc. Searchable with top left box. Did your browser try to download the PDF? If so, and it is not visible below click here to be redirected to the Rural Fire Service Queensland page for Fire Danger Rating.